Are you struggling to find out which O2 sensor you actually should replace? We get a lot of questions about how to locate which O2 sensor is bank 1 and which one is bank 2. That’s why I decided to write this article to sort it out once for all. It sounds really confusing with all the “Bank 1 Sensor 2 etc” but if you have learned it once, it’s not that complicated. I often hear about people that replaced the wrong sensors because they did not have the knowledge of which sensor they replaced. After you have checked out this article you won’t do the same mistake! What is bank 1 vs bank 2? The engine’s cylinders are often divided into two parts. If you have a V-engine you have one bank on each side of the engine. I hear a lot of rumours about guys that are telling others on the internet which side is bank 1 & 2. The real truth is that you can’t simplify it and say that bank 1 is on the driver’s side or vice versa because different engines can have cylinder 1 on different sides. We drive on different sides also, so it’s just really confusing and misleading to guess which side bank 1 -2 is. To find out how you can find out which side is bank 1 vs bank 2, continue to read down further in the article and I’ll explain how you can find it easily. But I have an inline 6 that is telling me bank 2? You may ask. That’s why I do not want to tell you a side which is bank 1 & 2. You can have bank 2 on both inline engines and transverse engines (Engines mounted in the other direction). If you know which cylinder that is number 1, there makes no difference if you have an inline or transverse engine. Bank 1 is always on cylinder 1 – 3 – 5 – 7 – 9 – 11 and bank 2 is always on cylinder 2 – 4 – 6 – 8 – 10 – 12. What is Sensor 1 & 2? The sensor number is telling us where on the exhaust system the O2 sensor or Exhaust temperature sensor is mounted. The 1st sensor is located closest to the engine and the last is located at the rear of the exhaust system. Some Diesel engines have a lot of exhaust temperature sensors and it can use Sensor 1 – 2 – 3 – 4 etc. 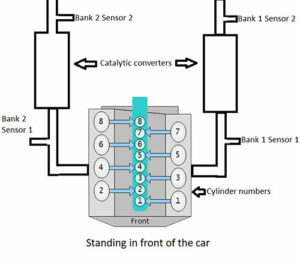 In these cases = Sensor 1 is located nearest the engine and the last sensor in the read of the exhaust system. How can I find the cylinder numbers? You can find the cylinder number in some different ways. On some vehicles, you can find the cylinder number stamped on the crankcase cover. If you have ignition cables there are also often numbers on those, but it’s not a recommended method because they can have been replaced/moved to another cylinder before. The most secure way is either to look if you can find it on the crankcase cover or find it the cylinder order in your service/repair manual. You can also call your authorized dealer and ask them if they have any information about it. You could also try to search the internet for it by searching for your engine code + firing order or cylinder order. If you are not sure, you can ask us a question for free at our homepage. If you have an OBD2 scanner at home, you can make this process a lot easier. If you do not have one and want to buy one, you can check out our review of Best OBD2 scanners. When you have access to a scanner, you can do this to find out which side is bank 1 and which is bank 2. Connect your OBD2 scanner and erase the trouble codes. Unplug one O2 sensor and check the DTC code. You will now see which is bank 1, and which is bank 2. By using this method, you will also solve any misinformation in the DTC tool and you will be 100% sure that you replace the right sensor. I have the DTC code P0420 also, which one should I fix first? The P0420 code can be triggered by a faulty O2 sensor. My recommendation is to troubleshoot the O2 sensor first as it may fix the P0420 code. Check if you can find any exhaust leaks, which could trigger both the P0420 and O2 sensor DTC code. If you want more help on how to diagnose the P0420 code, you can check out our P0420 Troubleshooting article. If you still do have any questions about this, comment down below and I will help you. If you have any other car questions, you are welcome to ask them for free at our homepage. I hope you enjoyed this article and would appreciate if you checked out our other articles also. Can bank 2 sensor 1 work in the same place as bank 1 sensor 2? Often the sensor one and sensor two is different. Check the part number and amount of wires to it. Sometimes you use a wideband sensor for the front sensor and a normal sensor for the 2nd! Is bank 1 on a Toyato sienna the front behind the radiator or the middle piece with pipes and a curve on it? Is one sensor just hanging in the air or are the sides mixed? If this is the case it will for sure run poorly and light up the engine light. You can’t switch the sensors between the banks, because if you do it will try to adjust the fuel on the wrong bank and cause the engine to run very poorly. My reader doesn’t specify if it is sensor 1 or 2… any other way to see. Hi there i have a 2006 ford focus. Engine code is HWDA. I have been told bank 2 sensor 2. Could you tell me were this is located.